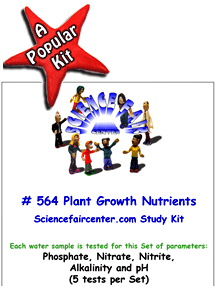 Plant Growth Nutrients in Water Tests for Fertilizer influence on plant growth. 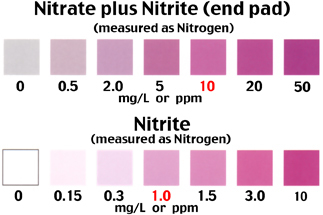 Plant Growth Nutrients in Water tests for nutrient uptake and release due to plant growth for Phosphate, Nitrate, Nitrite, Alkalinity and pH. Experiment for a first time science fair project. Testing only takes a few minutes per sample. 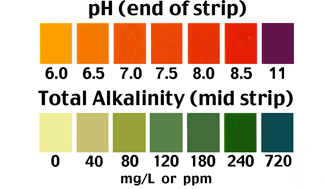 Each water sample is tested for this Set of parameters: Phosphate, Nitrate, Nitrite, Alkalinity and pH (5 tests per set). Fertilizer influence on plant growth. Experiment for a first time science fair project. Monitor nutrient uptake and release due to plant growth. Testing only takes a few minutes per sample.